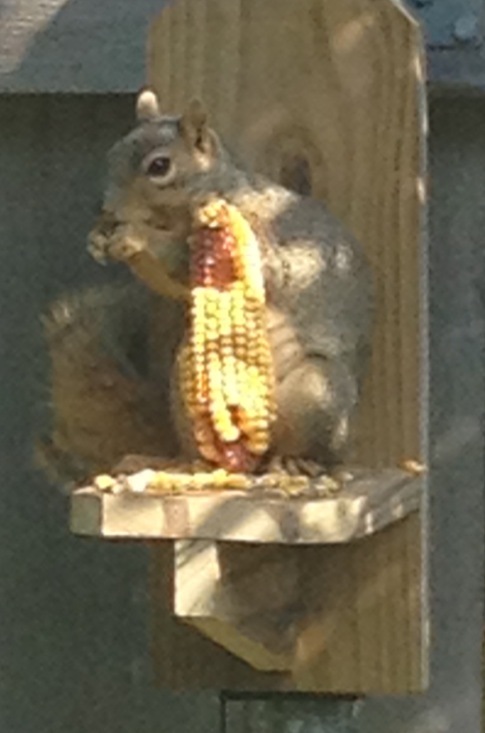 I suppose I always thought squirrels were squirrels wherever you went, but not so. Their sizes and shaped differ wherever you live. And if my back yard Lothario is any indication, they have different dispositions. In Arizona they had “ground squirrels”, small and cheerful little guys who like their name implies, live in the ground. They lacked the size and bushy tails of their eastern cousins, and look more like Chip and Dale than any squirrel I’ve have ever laid eyes on. In Iowa where I grew up, the squirrels look pretty standard, except for their beautiful black fur, unique to that area. Growing up I took it for granted that all, or most, squirrels were this color as it was all I knew. I still love watching those beautiful black squirrels in the evenings with my Mom from her courtyard whenever I am home visiting. We often will sit into the early evening until the sun sets and it is too dark to see them, but giggling at their cheerful play together as the baby squirrels leap from branch to branch until then. I find myself wondering if they’ll miss, but with skillful dexterity, they never do. God has given us the ability to jump from unbelief to belief…we are called to faith and called to trust. Like the branches of a tree God’s hand is there when we take leaps of faith into His perfect will. As I watch our dancing squirrels jump from my neighbor’s roof to a trellis, I am reminded of the woman warrior in Crouching Tiger Hidden Dragon (if you have not seen the movie, envision the jumping off the dunes at Kitty Hawk aka Orville and Wilbur Wright’s first flight. ), stealthily moving from limb to limb as if defying gravity, and I find myself wondering if perhaps Texas has flying squirrels… They are wonderful examples of God’s delicate, and intricate design, beautiful, sleek, agile, playful, yet taken for granted as the little scavengers of the back yard. Outrageous to think we metaphorically may look at challenges and literally jump off Jockey’s Ridge at Kitty Hawk with God offering Him praise and thanksgiving for the situation. Hope in Him and take a giant leap of Faith, not tomorrow, do it now.